The Toho Godzilla Movie Database section includes all Toho Godzilla films, and the Sony/Tristar Godzilla film. Each is listed by the Japanese title, followed by the American title if different, with years of release. To the right of the title is the rating of each film via IMDB (two ratings reflect different rating for Japanese and US versions). Each listing here on this page is a small piece of the full article, the link at the bottom of each post goes to the full article that is also here within the site (safe, no external links). Information in this section comes from Wikipedia, IMDB, and other sources. Other Toho monster movies and Legendary's Monsterverse are listed separate sections. Godzilla (ゴジラ Gojira) is a 1954 Japanese science fiction kaiju film produced by Toho, directed by Ishirō Honda, and featuring special effects by Eiji Tsuburaya. The film stars Akira Takarada, Momoko Kōchi, Akihiko Hirata, Takashi Shimura and Haruo Nakajima who portrayed the titular character until his retirement in 1972. The film tells the story of Godzilla, a prehistoric monster resurrected by repeated nuclear tests in the Pacific, who ravages Japan and reignites horrors of nuclear devastation to the very nation that experienced it first-hand. It was the first of many kaiju films released in Japan, paving the way and setting the standard for future kaiju films, many of which feature Godzilla. In 1956, TransWorld Releasing Corp. released Godzilla, King of the Monsters!, a heavily re-edited "Americanized" version of the original film which featured new footage, featuring Canadian actor Raymond Burr, shot exclusively for its North American release. In 1977 Italian director Luigi Cozzi released a modified and colorized version to magnetic band and sensurround theaters of the 1956 American version, known as Cozzilla by fans. In 2004 Rialto Pictures gave the original a limited theatrical release in the United States to coincide with the original film's 50th anniversary. When a Japanese fishing boat is attacked by a flash of light near Odo Island, another ship is sent to investigate only to meet the same fate with few survivors. On Odo Island, a village elder blames their poor fishing on a sea monster known as "Godzilla" and recalls that in earlier times girls were sacrificed to appease the giant sea monster. King Kong vs. Godzilla (キングコング対ゴジラ Kingu Kongu Tai Gojira) is a 1962 Japanese science fiction Kaiju film produced by Toho Studios. Directed by Ishirō Honda with visual effects by Eiji Tsuburaya, the film starred Tadao Takashima, Kenji Sahara, and Mie Hama. It was the third installment in the Godzilla series of films. It was also the first of two Japanese-made films featuring the King Kong character (or rather, its Toho Studios counterpart) and also the first time both King Kong and Godzilla appeared on film in color and widescreen. 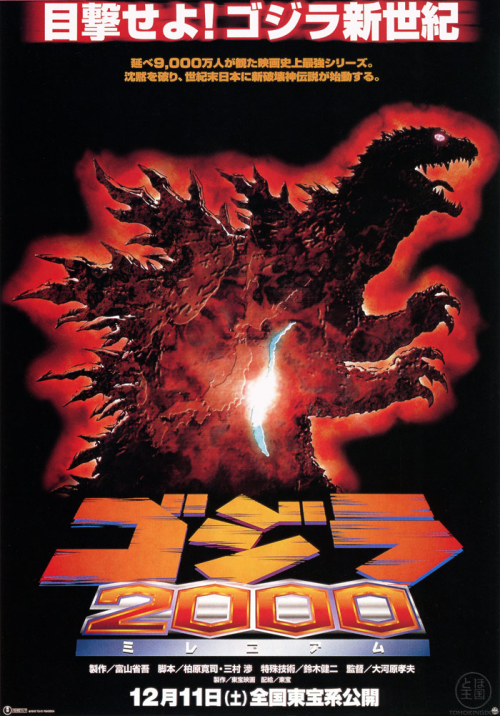 Produced as part of Toho's 30th anniversary celebration, this film remains the most commercially successful of all the Godzilla films to date. An American production team produced a heavily altered English version that used new scenes, sound and dubbing. The American production was released theatrically in the United States in the summer of 1963 by Universal International. Mr. Tako, head of Pacific Pharmaceuticals, is frustrated with the television shows his company is sponsoring and wants something to boost his ratings. When a doctor tells Tako about a giant monster he discovered on the small Faro Island, Tako believes that it would be a brilliant idea to use the monster to gain publicity. Tako immediately sends two men, Sakurai and Kinsaburo, to find and bring back the monster from Faro Island. Meanwhile, the American submarine Seahawk gets caught in an iceberg. Unfortunately, this is the same iceberg that Godzilla was trapped in by the Japanese Self-Defense Forces back in 1955, and the submarine is destroyed by the monster. As an American rescue helicopter circles the iceberg, Godzilla breaks out and heads towards a nearby Arctic military base, attacking it. The base itself is ineffective against Godzilla. 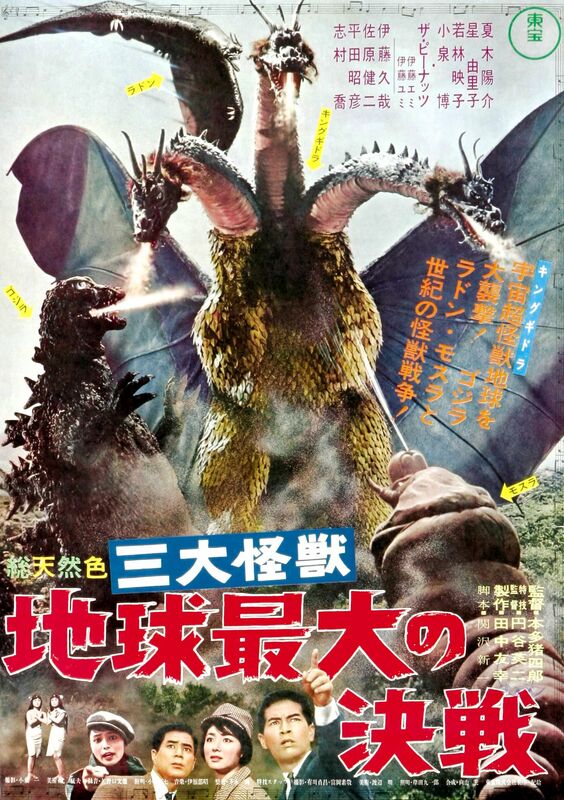 Ghidorah, the Three-Headed Monster, released in Japan as San Daikaijū: Chikyū Saidai no Kessen (三大怪獣 地球最大の決戦, lit. "Three Giant Monsters: The Greatest Battle on Earth"), is a 1964 Japanese science fiction kaiju film produced by Toho. Directed by Ishirō Honda, and featuring special effects by Eiji Tsuburaya, the film starred Yosuke Natsuki, Hiroshi Koizumi, and Akiko Wakabayashi. 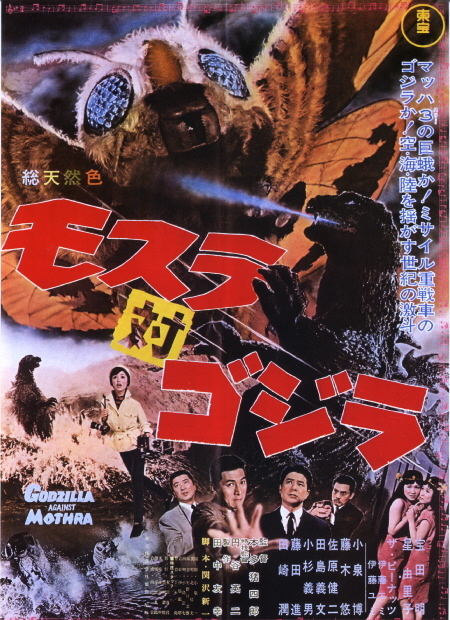 It is the fifth film in the Godzilla series and was the second Godzilla film produced that year (production began following Mothra vs Godzilla). This film marked the change of Godzilla from villain to hero in the series and featured the first appearance of King Ghidorah. The film was released theatrically in the United States in the Fall of 1965 by Continental Distributing as Ghidorah, the Three-Headed Monster. Police Detective Shindo (Yosuke Natsuki) is assigned to guard Princess Selina Salno of Selgina (Akiko Wakabayashi) during the Princess' visit to Japan, due to a suspected assassination plot. Although Shindo is smitten with Selina's photograph, her plane never makes it to Japan, as it is destroyed by a bomb en route. At exactly the same time a meteorite shower draws the attention of Professor Murai (Hiroshi Koizumi), who along with his team of scientists strikes out into the wilderness to examine the largest of the meteors, which has magnetic properties. To Shindo's surprise, the supposedly deceased Selina turns up in Japan, without her royal garb (including the golden bracelet that proves she is heir to the throne of Selgina), claiming to be from the planet Mars (in the English dub), and preaching to skeptical crowds of forthcoming disaster. Invasion of Astro-Monster, known in Japan as Kaijū Daisensō (怪獣大戦争, lit. 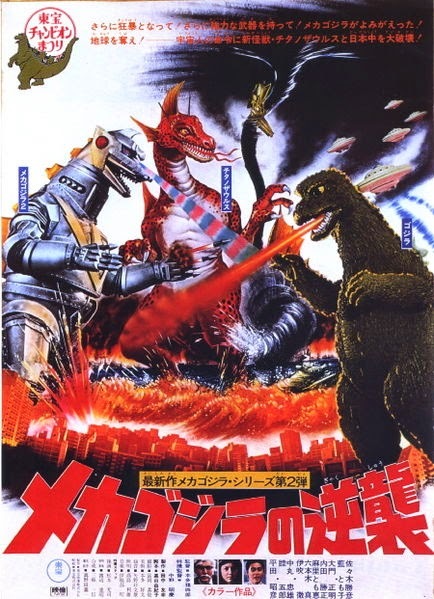 "Great Monster War"), is a Japanese Science Fiction kaiju film that is 6th in the Godzilla franchise. 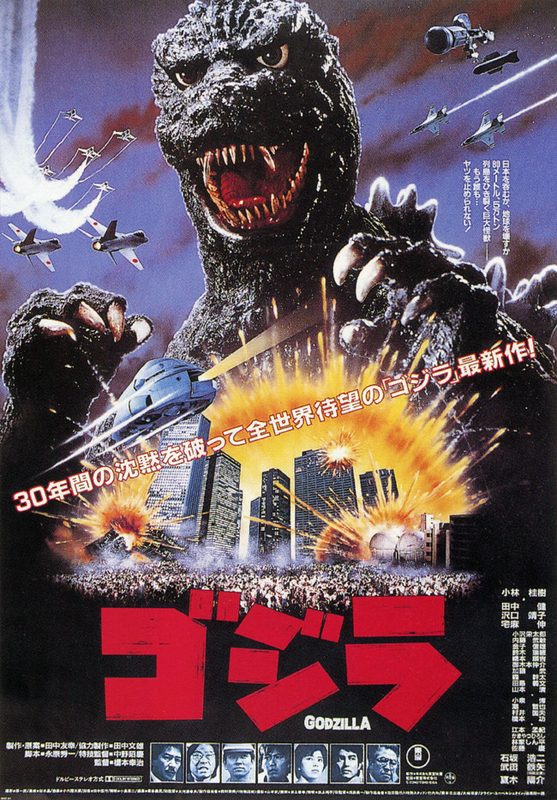 The film was co-produced between the Japanese company Toho, and Henry G. Saperstein's American company UPA, marking the only time a Godzilla film was co-produced with an American studio. Directed by Ishirō Honda, and featuring special effects by Eiji Tsuburaya, the film cast included the American actor Nick Adams, and Japanese actors Akira Takarada, Kumi Mizuno and Akira Kubo. This film is the first in the franchise to feature alien invaders, combining the series with outer space themes, such as civilizations on other planets and interplanetary space travel. The film was released theatrically in the United States in the summer of 1970 by Maron Films as Monster Zero, where it played nationwide on a double bill with War of the Gargantuas. In the late 1960s, a two-man spacecraft with a Japanese and an American crew (Fuji and Glenn), approaches Jupiter's orbit to explore the newly discovered Planet X; a planet that maintains a position directly behind Jupiter, leaving its surface in twilight, with just enough light to make it possible to navigate its surface. After landing and disembarking, one of the astronauts and the ship vanishes, leaving the other to wonder where they have gone. Suddenly, a flat voice comes over the communications link and instructs the lone astronaut down into subterranean corridors to the office of the Controller of Planet X, where he finds his shipmate. 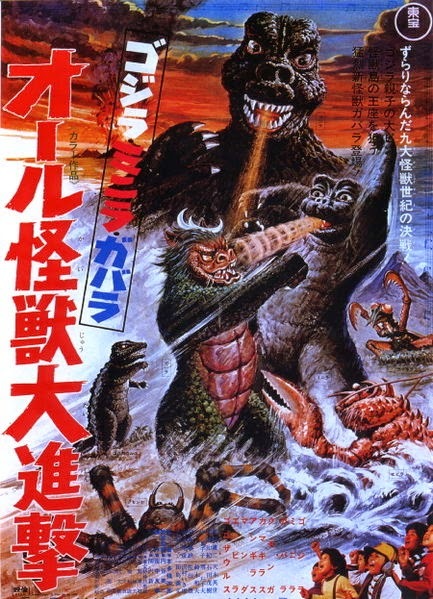 Ebirah, Horror of the Deep, (released in Japan as Godzilla, Ebirah, Mothra: Big Duel in the South Seas (ゴジラ・エビラ・モスラ 南海の大決闘 Gojira, Ebira, Mosura Nankai no Daikettō)) is a 1966 Japanese science fiction kaiju film produced by Toho. Directed by Jun Fukuda with special effects by Sadamasa Arikawa (supervised by Eiji Tsuburaya), the film starred Akira Takarada, Akihiko Hirata, and Eisei Amamoto. The 7th film in the Godzilla series, this was the first of two island themed adventure films starring Godzilla. The film was released straight to television in the United States in 1967 by the Walter Reade organization as Godzilla versus The Sea Monster. After Yata (Toru Ibuki) is lost at sea, his brother Ryota (Toru Watanabe) steals a yacht with his two friends and a bank robber, the crew runs afoul of the giant lobster Ebirah, and washes up on the shore of an island, where a terrorist organization manufactures heavy water for their purposes, as well as a chemical that keeps Ebirah at bay. The organization, known as the Red Bamboo, has enslaved natives from Infant Island to help them, but the natives hope to awaken Mothra to rescue them. In their efforts to avoid capture, Ryota and his friends, aided by a beautiful native girl, stumble across Godzilla sleeping within a cliffside cavern. The group devises a plan to defeat the Red Bamboo and escape from the island. In the process, they wake Godzilla using a lightning rod. Godzilla fights Ebirah, but the giant crustacean escapes. A team of scientists are trying to perfect a weather-controlling system. Their efforts are hampered by the arrival of a nosy reporter and by the sudden presence of 2-meter tall giant praying mantises. The first test of the weather control system goes awry when the remote control for a radioactive balloon is jammed by an unexplained signal coming from the center of the island. The balloon detonates prematurely, creating a radioactive storm that causes the giant mantises to grow to enormous sizes. Investigating the mantises, which are named Kamacuras (Gimantis in the English-dubbed version), the scientists find the monstrous insects digging an egg out from under a pile of earth. The egg hatches, revealing a baby Godzilla. The scientists realize that the baby's telepathic cries for help were the cause of the interference that ruined their experiment. 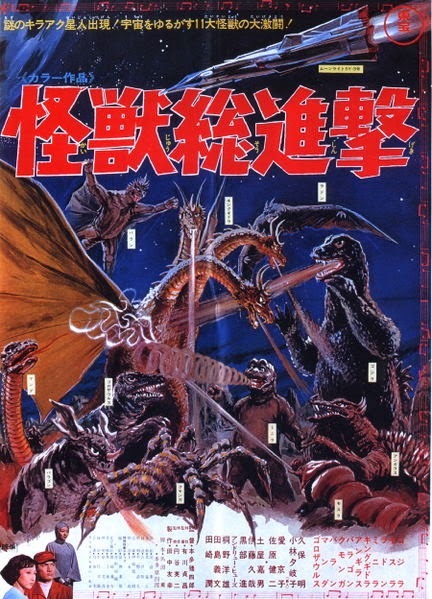 Destroy All Monsters, released in Japan as Kaijū Sōshingeki (怪獣総進撃, lit. "Charge of the Monsters"), is a 1968 Japanese Science fiction Kaiju film produced by Toho. The ninth entry in the original Godzilla series, it stars Akira Kubo, Jun Tazaki, Yukiko Kobayashi and Yoshio Tsuchiya. Produced in celebration as Toho's 20th kaiju film, it was also originally intended to be the final Godzilla film, and as such, was given a bigger budget than the past few productions. 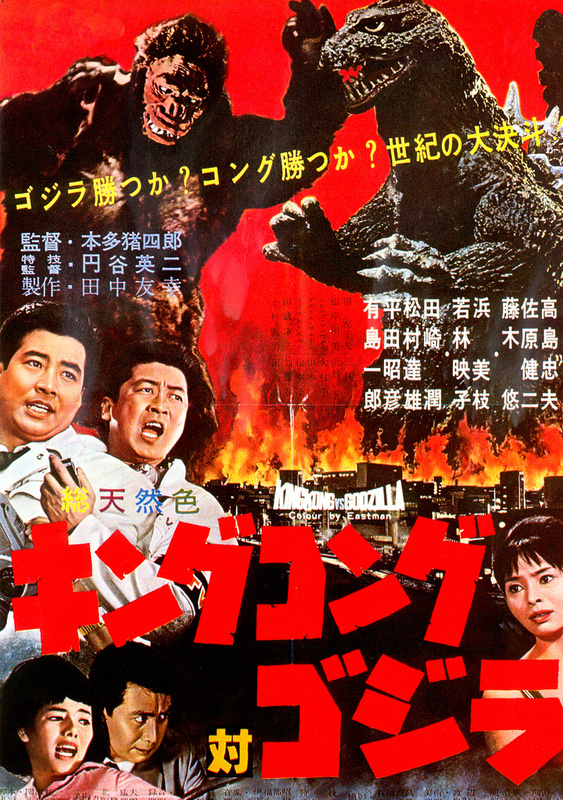 Set at the end of the 20th century, the film features many of Toho's earlier monsters, eleven in all. The film was also the last to be produced by the main creators of the Godzilla character, with Ishirō Honda directing, Eiji Tsuburaya supervising the special effects (with Sadamasa Arikawa actually directing), Tomoyuki Tanaka producing, and Akira Ifukube handling the film's score. The film was released theatrically in the United States in the Spring of 1969 by American International Pictures. At the close of the 20th century, all of the Earth's kaiju have been collected and confined in an area known as Monsterland, by the United Nations Science Committee, in the Ogasawara island chain. A special control center is constructed underneath the island to ensure the monsters stay secure, and serve as a research facility to study them. When communications with Monsterland are suddenly and mysteriously severed, and all of the monsters begin attacking world capitals, Dr. Yoshida of the UNSC orders Captain Yamabe and the crew of his spaceship, Moonlight SY-3, to investigate Ogasawara. All Monsters Attack, released in Japan as Godzilla, Minilla, Gabara: All Kaijū Daishingeki (ゴジラ・ミニラ・ガバラ オール怪獣大進撃, lit. "Godzilla, Minilla, and Gabara: All Monsters Attack'"), is a 1969 Japanese Kaiju film produced by Toho. Directed by Ishirō Honda, the film starred Tomonori Yazaki, Eisei Amamoto, and Kenji Sahara. 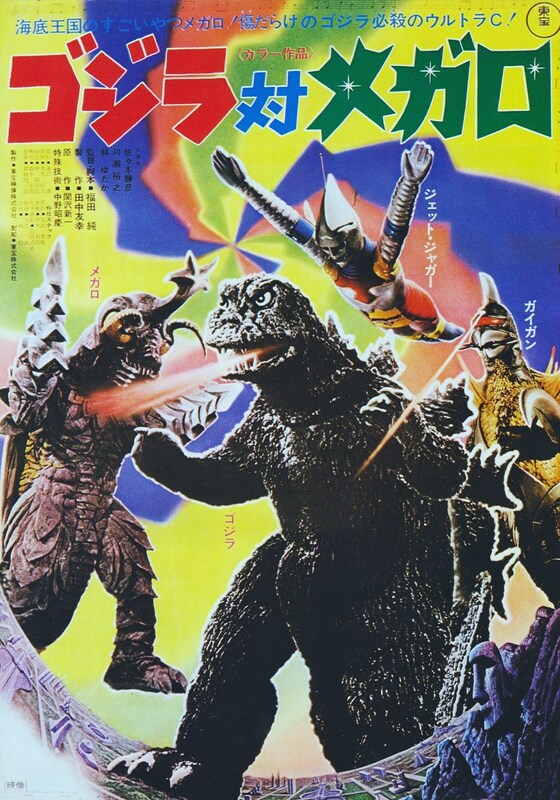 The 10th film in the Godzilla series, this was also the first film specifically geared towards children. While credited with the special effects work, Eiji Tsuburaya was not directly involved with the production of this film. The "Special Effects Supervised by" credit was given out of respect, since he was still the head of the Visual Effects Department. The effects were handled by Ishirō Honda himself, with assistance from Teruyoshi Nakano. 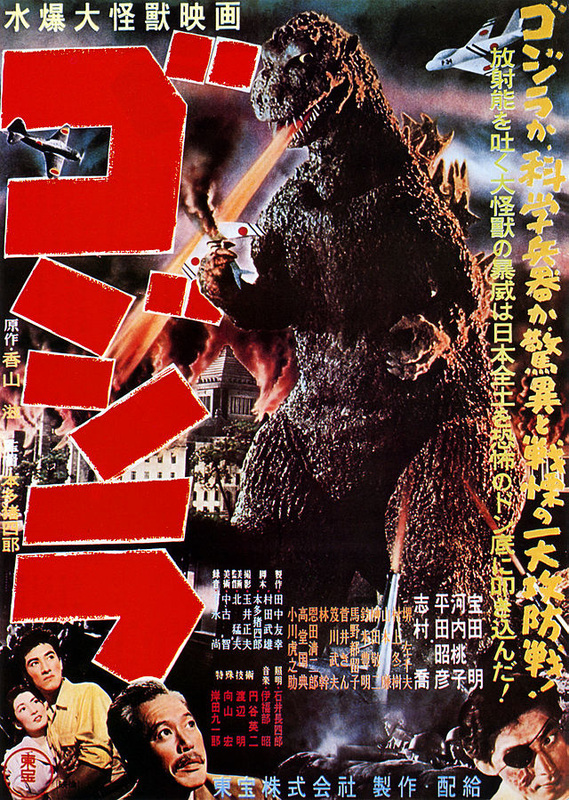 The film was released theatrically in the United States in the winter of 1971 by Maron Films as Godzilla's Revenge, where it was paired up nationwide on a double bill with Island of the Burning Damned. Ichiro Miki (Tomonori Yazaki) is a highly imaginative but lonely latchkey kid growing up in urban (and at that time, polluted) Tokyo. Every day he comes home to his family's empty apartment. His only friends are a toymaker named Shinpei Inami (Eisei Amamoto) and a young girl named Sachiko (Hidemi Ito). Every day after school, Ichiro is tormented by a gang of bullies led by a child named Sancho (Junichi Ito), whom Ichiro has nicknamed "Gabara." To escape his loneliness, Ichiro sleeps and dreams about visiting Monster Island. During his visit he witnesses Godzilla battle three Kamacuras and Ebirah, a giant sea monster. Ichiro is then chased by a rogue Kamacuras and falls into a deep cave, but luckily avoids being caught by Kamacuras. 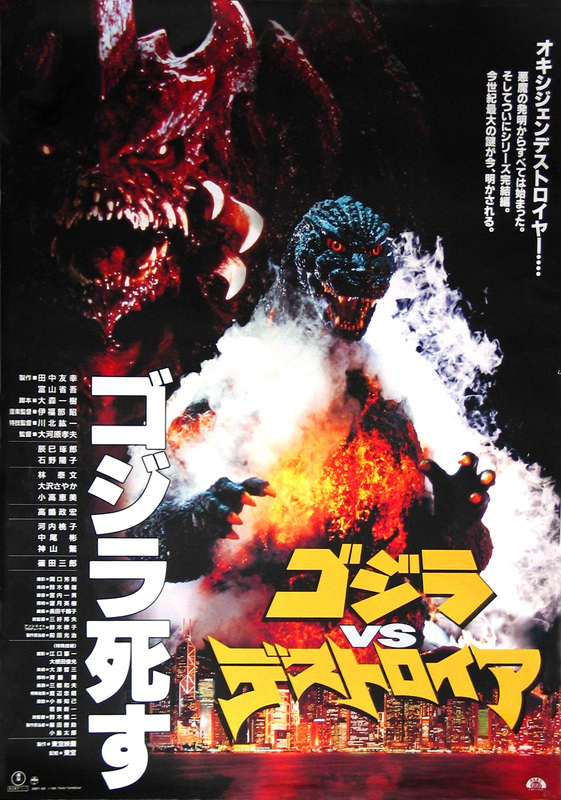 Godzilla vs. Hedorah (ゴジラ対ヘドラ Gojira tai Hedora), is a 1971 Japanese science fiction kaiju film produced by Toho. Directed by Yoshimitsu Banno and featuring special effects by Teruyoshi Nakano, the film starred Akira Yamauchi, Toshie Kimura, and Hiroyuki Kawase. 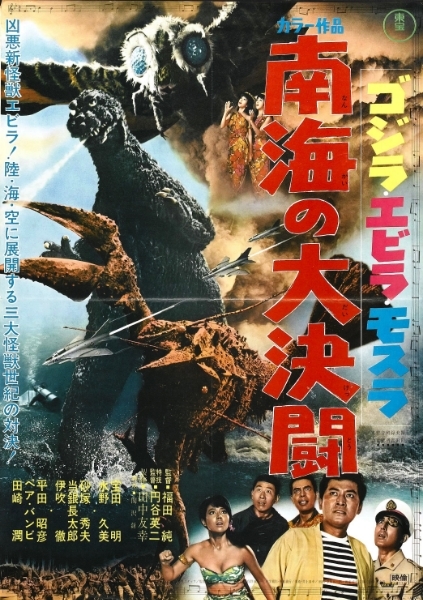 The 11th film in the Godzilla series, the film had a strong anti-pollution message with director Banno being inspired after visiting a polluted beach near Yokkaichi. 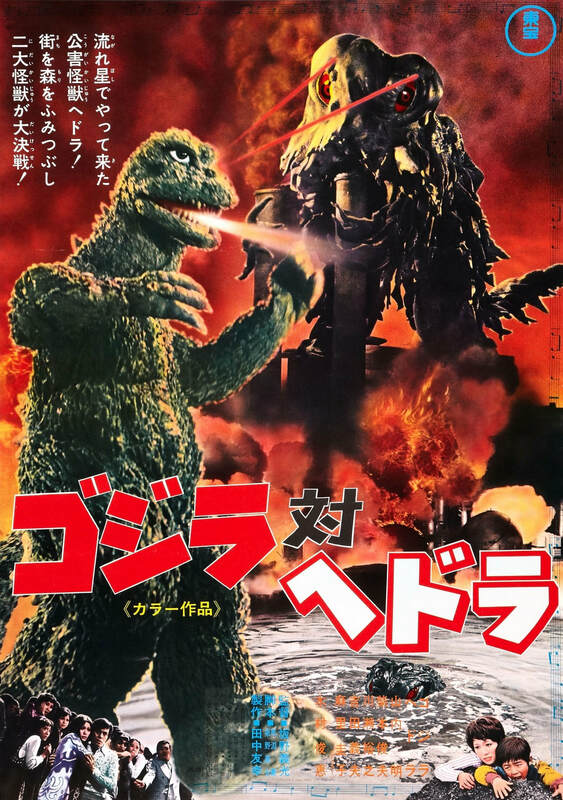 The film was released theatrically in the United States in the Spring of 1972 by American International Pictures as Godzilla vs. the Smog Monster. The microscopic alien lifeform Hedorah feeds on Earth's pollution and grows into a poisonous, acid-secreting sea monster. After it sinks an oil tanker and attacks Dr. Yano and his young son Ken, scarring them both, Hedorah's toxic existence is revealed to the public. Ken has visions of Godzilla fighting the world's pollution, and insists Godzilla will come to humankind's aid against Hedorah. Hedorah metamorphoses into an amphibian form, allowing it to move onto land to feed on additional sources of pollution. Hedorah is confronted by Godzilla. Hedorah is easily overpowered by Godzilla and retreats into the sea. It returns shortly thereafter in a flying saucer shape demonstrating new, even deadlier forms which it can switch between at will. Thousands of people die in Hedorah's raids and even Godzilla is overwhelmed by Hedorah's poisonous emissions. As hope sinks, a party is thrown on Mt. Fuji to celebrate one last day of life before humankind succumbs to Hedorah. Ken realizes that Godzilla and Hedorah have come to Mt. Fuji as well for a final confrontation. 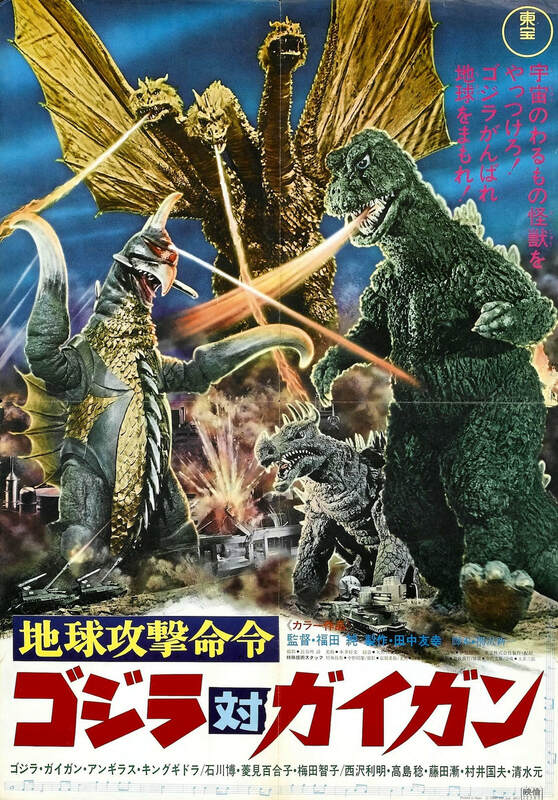 Godzilla vs. Gigan, released in Japan as Chikyū Kogeki Meirei: Godzilla tai Gigan (地球攻撃命令 ゴジラ対ガイガン, lit. "Earth Destruction Directive: Godzilla vs. Gigan"), is a 1972 Japanese Science Fiction Kaiju film produced by Toho. Directed by Jun Fukuda with special effects by Teruyoshi Nakano, the film starred Hiroshi Ishikawa, Yuriko Hishimi and Minoru Takashima. The 12th film of the Godzilla series, this film featured the return of Godzilla's greatest foe King Ghidorah. Producer Tomoyuki Tanaka was displeased with the previous film, Godzilla vs Hedorah, and wanted to return the series to the more traditional route of well known monsters and an alien invasion plot. This was the last film in which Godzilla was portrayed by Haruo Nakajima who had played the character since the first film in 1954. The film received a limited theatrical release in the United States in 1978 by Cinema Shares as Godzilla on Monster Island. Giant insectoid aliens from a dying planet in "Space Hunter Nebula-M" plot to colonize the Earth. The aliens assume the forms of dead humans and work as the development staff of the peace-themed theme park, World Children's Land, the centerpiece of which is "Godzilla Tower". The Nebula-M aliens plan to use the space monsters Gigan and King Ghidorah, guided by two "Action Signal Tapes," to wipe out human civilization. Manga artist Gengo Kotaka stumbles onto their plan after being hired as a concept artist for the park. When Gengo and his friends accidentally obtain one of the Action Signal Tapes and play it, Godzilla and Anguirus hear the signal and realize something is amiss. Godzilla sends Anguirus to investigate. The film was released theatrically in the United States in the summer of 1976 by Cinema Shares. Afterwards it became the only Godzilla film to receive a television premiere on a major U.S network, as NBC aired it on prime time television in the summer of 1977, where it was hosted by actor John Belushi dressed in a Godzilla costume. In the year 197X, the most recent underground nuclear test, set off near the Aleutians, sends shockwaves as far south as Monster Island, disturing the monsters, and even causing Anguirus to fall into a fault opened up by the consequential earthquakes. For years, Seatopia, the undersea civilization, has been heavily affected by this nuclear testing conducted by the surface nations of the world. Upset by these tests, the Seatopians plan to unleash their civilization's god, Megalon, to the surface to destroy the world out of vengeance. On the surface, an inventor named Goro Ibuki, his nephew Rokuro and their friend Hiroshi Jinkawa are off on an outing near a lake when Seatopia makes itself known to the Earth by drying up the lake the trio was relaxing nearby and using it as a base of operation (unknown to our heroes). Godzilla vs. Mechagodzilla (ゴジラ対メカゴジラ Gojira Tai Mekagojira), is a 1974 Japanese science fiction kaiju film produced by Toho. Directed by Jun Fukuda and featuring special effects by Teruyoshi Nakano, the film starred Gorō Mutsumi, Hiroshi Koizumi and Kenji Sahara. 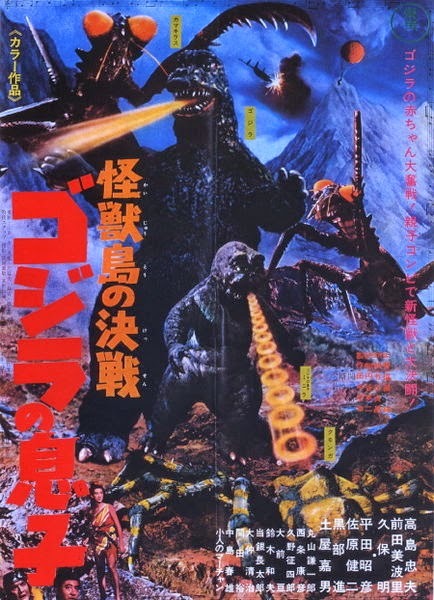 The 14th film of the Godzilla series, it featured a slightly bigger budget with higher production values then the previous few films of the series. 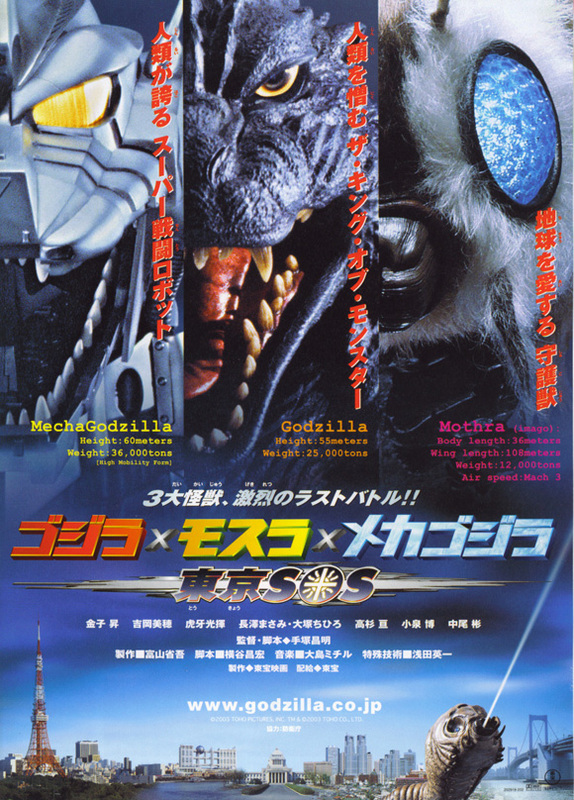 The film introduced a mechanical version of Godzilla called Mechagodzilla, and also introduced a character called King Caesar based on the legend of the Shisa. The film received a very limited theatrical release in the United States in early 1977 by Cinema Shares as Godzilla vs. The Bionic Monster. After roughly a week into its release, the film was reissued with the altered title of Godzilla vs. The Cosmic Monster. Strange events are taking place in Okinawa. An Azumi priestess has a terrifying vision of a city being destroyed by a giant monster. A type of metal not found on earth is discovered in a cave by a spelunker, Masahiko Shimizu, who takes it to Professor Miyajima for examination. An excavation led by Masahiko's brother Keisuke accidentally uncovers a chamber filled with ancient artifacts and a mural bearing an ominous prophecy: "When a black mountain appears above the clouds, a huge monster will arise and try to destroy the world; but then, when the red moon sets and the sun rises in the west, two more shall appear to save humanity." Keisuke is joined by archaeologist Saeko Kaneshiro, who translates the prophecy and takes one of the artifacts, bearing the likeness of the legendary monster King Caesar, to study. Two men stalk them, one who speaks to them and claims to be a reporter interested in the story, the other of whom attempts to steal the statue from them but fails and flees. 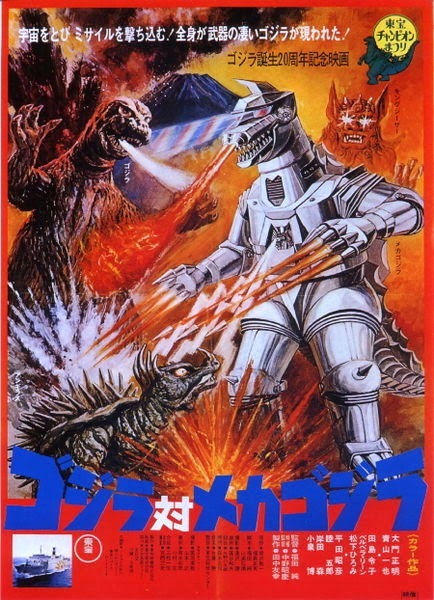 Terror of Mechagodzilla (released in Japan as Counterattack of Mechagodzilla (メカゴジラの逆襲 Mekagojira no Gyakushū)) is a 1975 Japanese science fiction kaiju film produced by Toho. Directed by Ishirō Honda and featuring special effects by Teruyoshi Nakano, the film starred Tomoko Ai, Gorō Mutsumi, and Akihiko Hirata. This film was the 15th and final film in the original series of Godzilla films, before the series reboot in 1984. 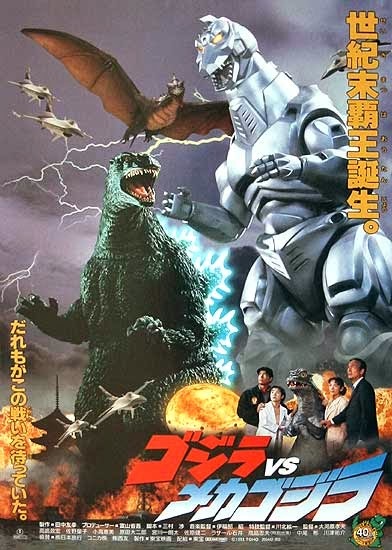 A direct sequel to the previous year's Godzilla vs. Mechagodzilla, this film was the least successful commercially of the entire Godzilla franchise. The movie takes place between Godzilla vs. Mechagodzilla and Destroy All Monsters. This was the last Godzilla film directed by Ishirō Honda. In the United States, it received a very limited theatrical release in the summer of 1978 by Bob Conn Enterprises as The Terror of Godzilla. Continuing after the end of the final film, Interpol agents, led by Inspector Kusaka, search for the wreck of Mechagodzilla at the bottom of the Okinawan Sea. Using the submarine, Akatsuki, they hope to gather information on the robot's builders, the alien simians. The Akatsuki is suddenly attacked by a giant aquatic dinosaur called Titanosaurus, and the crew vanishes. Interpol starts an investigation into the incident. With the help of marine biologist Akira Ichinose, they trace the Titanosaurus to a reclusive, mad scientist named Shinzô Mafune, who wants to destroy all mankind. While Ichinose is visiting his old home in the seaside forest of Manazuru, they meet Mafune's lone daughter, Katsura. The Return of Godzilla, released in Japan as Godzilla (ゴジラ Gojira), is a Japanese science fiction kaiju film produced by Toho. Directed by Koji Hashimoto, with special effects by Teruyoshi Nakano, the film starred Ken Tanaka, Yasuko Sawaguchi, and Yosuke Natsuki. The sixteenth film in Toho's Godzilla series, it marked the beginning of a rebooted series of Godzilla films that ignores all the films from 1955's Godzilla Raids Again through 1975's Terror of Mechagodzilla. The film acts as a direct sequel to the original 1954 film Godzilla. Produced as part of Godzilla's 30th anniversary, the film returned the series to the darker themes and mood of some of the early films and returned Godzilla to his destructive antagonistic roots. The film was used as the basis for Godzilla 1985. Edited and with new scenes shot in the United States, Godzilla 1985 was released theatrically in the United States in the Summer of 1985 by New World Pictures. The American version of the film featured Canadian actor Raymond Burr reprising his character Steve Martin, from the film Godzilla, King of the Monsters!, which was also made in the same way. Three months after a volcanic eruption on Daikoku Island, the Yahata-Maru Japanese fishing vessel is caught in strong currents off its shores. As the boat drifts into shore, the island begins to erupt, and a giant monster lifts itself out of the volcano. A few days later, reporter Goro Maki is sailing in the area and finds the vessel intact but deserted. As he explores the vessel, he finds all the crew dead except for one young man called Hiroshi Okumura, who has been badly wounded. Suddenly a giant Shockirus sea louse attacks but is eventually killed with some difficulty. Godzilla vs. Biollante (ゴジラvsビオランテ Gojira tai Biorante) is a 1989 Japanese science fiction kaiju film produced by Toho. The film was written and directed by Kazuki Ōmori, and stars Kunihiko Mitamura, Yoshiko Tanaka, Masanobu Takashima, and Megumi Odaka. The seventeenth installment in the Godzilla series, the film is a belated sequel to The Return of Godzilla from 5 years earlier. This was the first "monster vs monster" film from this rebooted series. 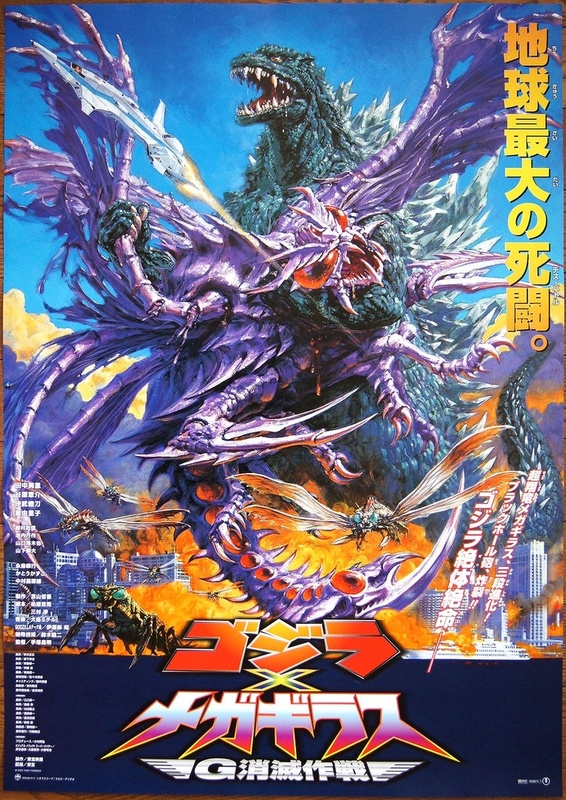 It featured a new monster called Biollante, with producer Tomoyuki Tanaka desiring new monster opponents for Godzilla rather than using characters from the original films. As part of pre-release publicity, Tanaka solicited script ideas from the public with 5,000 entries being received. The winning entry that was selected was from Shinichiro Kobayashi, a dentist and occasional science fiction writer. Director Ōmori then adapted it into the film's script. The film was released direct to video in the United States in November 25, 1992 by HBO Video. In 1984, a scientific team picks through the ruins of Tokyo, searching for tissue samples left behind by Godzilla. U.S. troops working for the genetic engineering company Bio-Major attempt to escape with a sample, but they are dispatched by a lone mercenary who steals the sample. Meanwhile, in the Middle East, researcher Genshiro Shiragami looks forward to returning to Japan with his daughter, Erika. However, a terrorist bombing destroys his research facility and kills Erika. Five years later, Shiragami is now a haunted man studying the psychic energy of roses. Psychic Miki Saegusa, who heads an institution for intuitive children, aids him in his research. Two groups are watching Shiragami: a gang of thieves hired by Bio-Major and an assassin from a Middle Eastern country called Saradia. As it turns out, Shiragami is involved in the study of Godzilla cells. Godzilla vs. King Ghidorah (ゴジラvsキングギドラ Gojira tai Kingu Gidora), is a 1991 Japanese science fiction kaiju film produced by Toho Co., Ltd.. Directed by Kazuki Omori, and featuring special effects by Koichi Kawakita, the film starred Anna Nakagawa, Megumi Odaka, and Akiji Kobayashi. 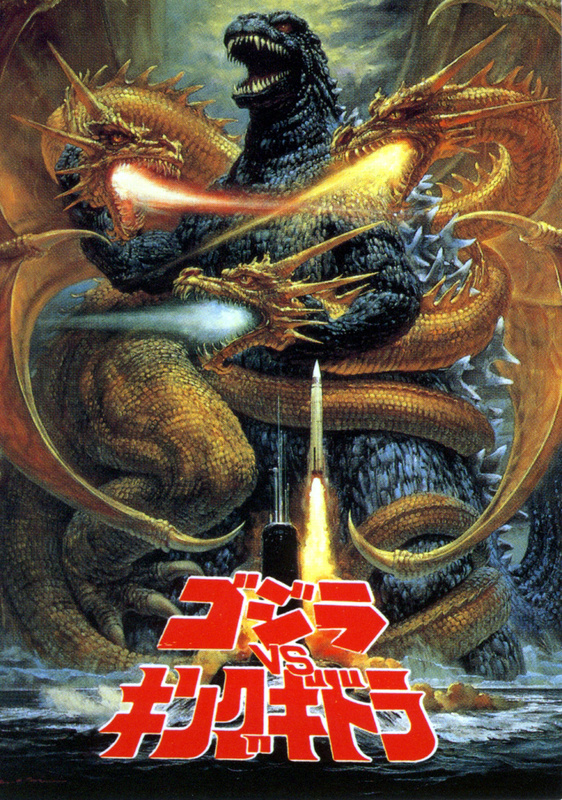 The 18th installment in the Godzilla series, the film featured the return of Godzilla's greatest foe, the three-headed King Ghidorah. Tomoyuki Tanaka had originally desired to create new monster opponents for the series, but after the box office disappointment of 1989's Godzilla vs Biollante, opted to bring back classic foes instead. The film was a box office hit, with sequels released on a yearly basis until 1995. It won a Japanese Academy Award for special effects. The film was released direct to video in the United States in 1998 by Columbia Tristar Home Video as Godzilla vs. King Ghidorah. Kenichiro Terasawa (Kosuke Toyohara), an author of books on psychic phenomena, believes he's discovered Godzilla's true origin. During World War II, a group of Japanese soldiers stationed on Lagos Island in South Pacific  were unintentionally saved by a Godzillasaurus, which attacked and killed a group of American soldiers who had landed on the island in February 1944 as part of the Gilbert and Marshall Islands campaign. While all of the Japanese soldiers on the nearby Islands fought and died to the last man, the Japanese soldiers on Lagos survived the war and eventually returned to Japan. In 1954, the island was destroyed by a hydrogen bomb test, just months before Godzilla first attacked Tokyo. 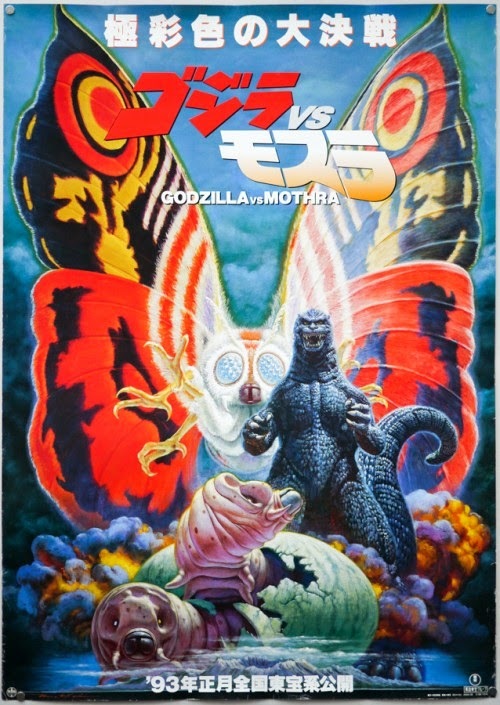 Godzilla vs. Mothra (ゴジラvsモスラ Gojira tai Mosura) is a 1992 Japanese science fiction kaiju film produced by Toho Co., Ltd.. Directed by Takao Okawara with special effects by Koichi Kawakita, the film stars Tetsuya Bessho, Satomi Kobayashi and Akiji Kobayashi. The 19th installment in the Godzilla series, unadjusted for inflation the film remains the highest grossing film of the entire Godzilla series. After the success of the previous year's Godzilla vs King Ghidorah, Toho decided to bring back Mothra, their second most famous creation. Composer Akira Ifukube won a Japanese Academy Award for his score. The film was the second highest grossing film in Japan in 1993, second only to Jurassic Park. 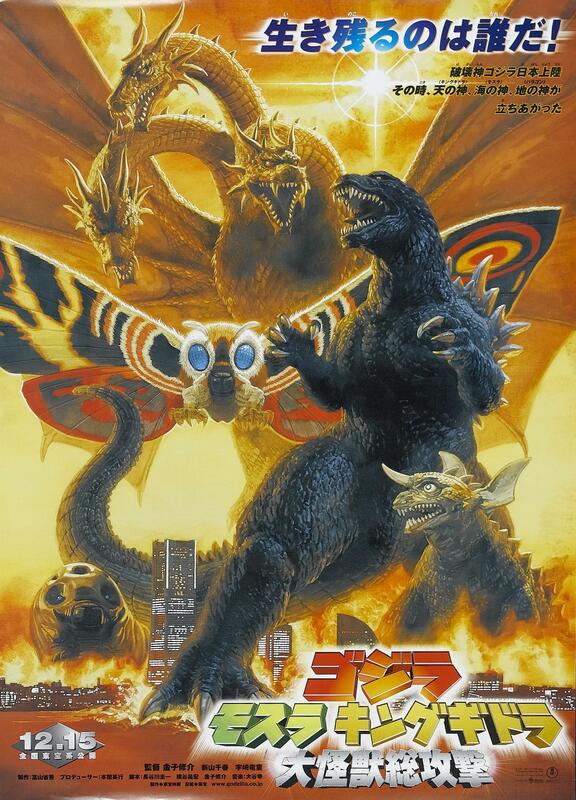 The film was released direct to video in the United States in 1998 by Columbia Tristar Home Video as Godzilla and Mothra: The Battle for Earth. A large meteor hurtles towards earth, lands in the ocean and awakens Godzilla. One particularly large typhoon is monitored over the Pacific ocean. The next day, a young man named Takuya Fujita is detained after stealing an ancient artifact. Later, a representative of the Japanese Prime Minister arrives with Takuya's ex-wife, Masako Tezuka, and offers him to explore an island with Masako and Marutomo company secretary, Kenji Ando, and become a free man. Takuya initially turns down the offer, on the basis that he is to be released in another week. But after his ex-wife informs him that his sentence has been reconsidered, he accepts. After the trio arrives at the island, they find a cave behind a waterfall. Inside, they discover ancient paintings, including a picture of two giant insects fighting one another. While studying them, the sun shines through a hole in the wall, and the light points to a small opening in the cave, where they come upon a giant egg. Godzilla vs. SpaceGodzilla (ゴジラvsスペースゴジラ Gojira tai SupēsuGojira) is a 1994 Japanese science fiction kaiju film produced by Toho. Directed by Kensho Yamashita and featuring special effects by Koichi Kawakita, the film starred Megumi Odaka, Jun Hashizume, and Akira Emoto. It was the twenty-first film in the Godzilla series. 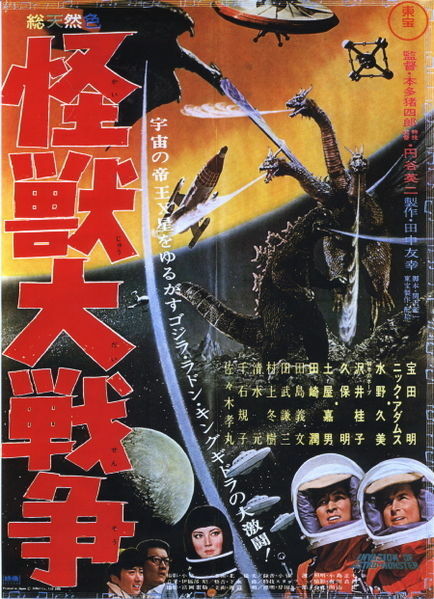 The film featured Godzilla battling an evil doppelgänger from outer space called SpaceGodzilla. The film was released direct to video in the United States in 1999 by Columbia Tristar Home Video. Godzilla cells brought into space by Biollante and Mothra are exposed to intense radiation from a black hole. The celestial fission creates a highly aggressive extraterrestrial beast closely resembling Godzilla. This "SpaceGodzilla" quickly makes its way to Earth. Meanwhile, a group of soldiers and scientists are setting up at Birth Island to try Project T against Godzilla, who has taken up residence on the isle. The plan is to plant a device on Godzilla which will allow the Japan Self Defense Forces to control the mutant dinosaur telepathically. With help from psychic Miki Saegusa, the project is put into action, but it ultimately fails. Afterward, the Cosmos, Mothra's twin priestesses, appear to Miki and warn her of SpaceGodzilla's arrival. With Mothra gone to space, the world will have to rely on Godzilla to stop the invader. SpaceGodzilla gets closer and closer to Earth, destroying a NASA space station along the way, Moguera, a giant penguin-like robot built by the JSDF to replace the Mechagodzilla, is sent in to intercept SpaceGodzilla, but the alien uses a number of psychic attacks to cripple the robot, forcing it to retreat. 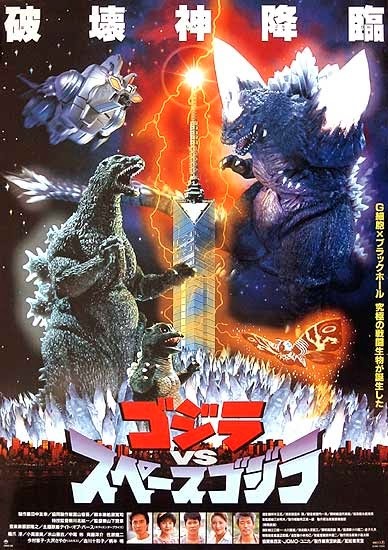 Godzilla vs. Destoroyah (ゴジラvsデストロイア Gojira tai Desutoroia), is a 1995 Japanese science fiction kaiju film produced by Toho Co., Ltd.. Directed by Takao Okawara, with special effects by Koichi Kawakita, the film starred Takuro Tatsumi, Yasufumi Hayashi and Megumi Odaka. 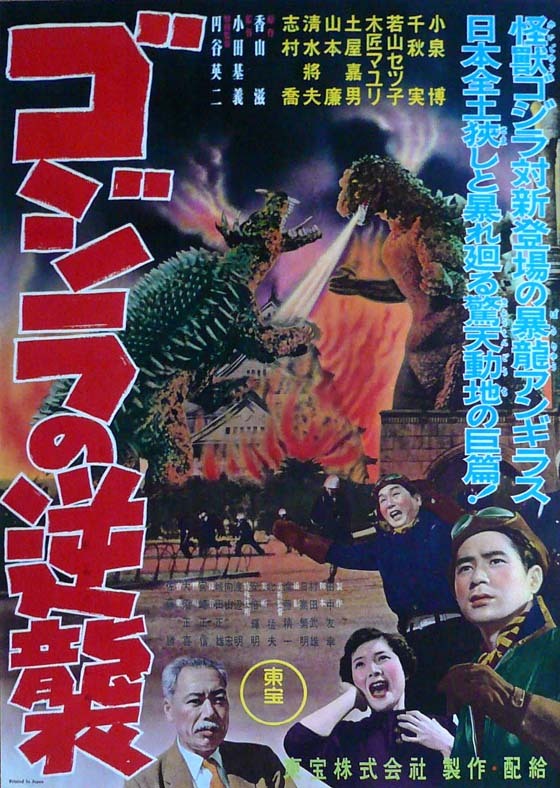 The film also featured a cameo by Momoko Kōchi, reprising her role from the original Godzilla (1954). This twenty-second installment in the Godzilla franchise was the final film in the Heisei, or second, series of films. The film received publicity around the world for Toho's announcement that they would kill Godzilla. Toho ended the series to make way for an American Godzilla film, which was ultimately produced in 1998. Toho would begin a new series of Godzilla films in 1999 with the film Godzilla 2000, which began the Millennium series. In 1996, after the death of SpaceGodzilla, Miki Saegusa travels to Birth Island to check on Godzilla and his adopted son. However, she finds the entire island destroyed. In Hong Kong, Godzilla appears covered in glowing lava-like rashes. He goes on a rampage, causing major collateral damage and killing thousands of civilians. A group of representatives from the Japan Self Defense Forces hire college student Kenichi Yamane, the grandson of Dr. Kyohei Yamane, to come work at the center in an attempt to unravel the mystery of Godzilla's condition. Yamane suspects that Godzilla's heart, which acts as a nuclear reactor, is going through a nuclear meltdown. When Godzilla reaches 1,200 degrees Celsius, he will explode with more force than all of the world's nuclear weapons, taking the world with him. Godzilla is a 1998 American science fiction monster film directed and co-written by Roland Emmerich. It was a reimagining of the popular Japanese film monster of the same name. The screenplay was written by Emmerich and Dean Devlin. The plot of the film revolves around a giant reptilian monster, mutated by nuclear tests in the French Polynesia, who migrates to New York City to nest its young. The cast features Matthew Broderick, Maria Pitillo, Hank Azaria, Kevin Dunn and Jean Reno. The film was a co-production between Centropolis Entertainment and TriStar Pictures, with TriStar distributing theatrically, and Sony Pictures Entertainment for home media. On May 19, 1998, the Original Motion Picture Soundtrack was released Epic Records. It features songs written by several recording artists including The Wallflowers, Rage Against the Machine, Silverchair, and Foo Fighters. The film score was composed and orchestrated by David Arnold. Godzilla premiered in theaters nationwide in the United States on May 20, 1998 grossing $136,314,294 in domestic ticket receipts. It earned an additional $242,700,000 through international release to top out at a combined $379,014,294 in gross revenue. The film was met with a negative reception from critics and fans alike. The negative reception highlighted by critics included the film's thin plot, acting, and directing while fans targeted the film's drastic reinvention of the titular character, which included its radical redesign and departure from the source material. Because of this, the film was nominated for and won multiple Raspberry Awards, including Worst Remake or Sequel, but received recognition in the field of computer-generated imagery by winning the Saturn Award for Best Special Effects. Planned sequels were abandoned, despite a well-received animated series airing September 12, 1998 on the Fox Kids network. Godzilla 2000: Millennium (ゴジラ2000 ミレニアム Gojira Nisen: Mireniamu) is a 1999 Japanese science fiction kaiju film directed by Takao Okawara and written by Hiroshi Kashiwabara and Wataru Mimura. It was the twenty-third film released in the Godzilla series, and is the only film to feature Orga. The film was released on December 11, 1999. 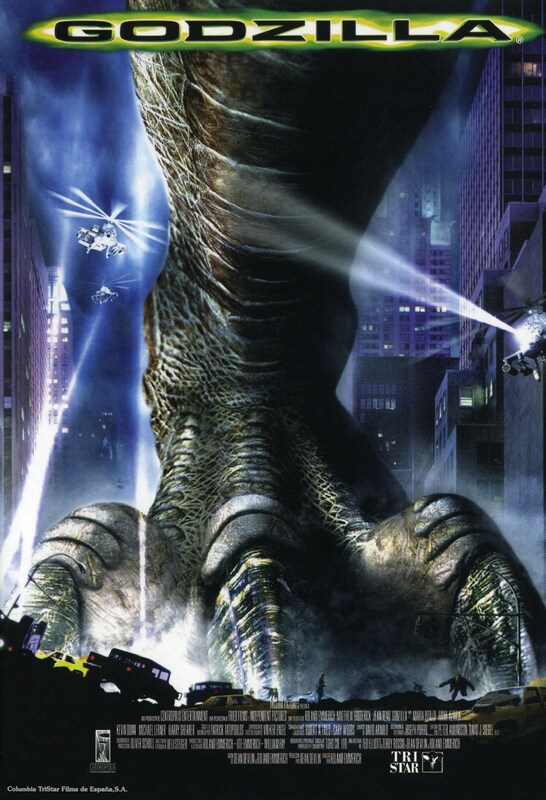 Sony Pictures Entertainment's TriStar division, having the rights to the franchise at the time, released the film in the United States and Canada in August 2000 as Godzilla 2000; the last in the main Godzilla series to make a North American theatrical run until the Legendary Pictures remake. The film ignores continuity established by any previous films, aside from the original. The film was released on DVD by Sony Pictures on December 26, 2000, also under the title Godzilla 2000. Godzilla is a literal force of nature to Japan (after the incident in 1954). After Y2K, the Godzilla Prediction Network (GPN) functions independently to study the mutant dinosaur and predict his landfalls. Meanwhile, the scientists of Crisis Control Intelligence (CCI) find a sixty million year old UFO deep in the Japan Trench. As CCI attempts to raise the UFO to study it, it takes off into the sky on its own. Godzilla arrives and battles the Japan Self Defense Forces, now equipped with powerful Full Metal Missiles, but the UFO appears, searching for genetic information that only Godzilla possesses. It fights Godzilla to a standstill, driving the monster underwater, and then lands to replenish its solar power. Yuji Shinoda, the founder of the GPN, discovers the secret to Godzilla's regenerative properties (named Organizer G1 in the Japanese version, but Regenerator G1 in the North American release), but so has the UFO. It frees itself from the JSDF's attempts to contain it, and heads for Shinjuku. Godzilla vs. Megaguirus, released in Japan as Godzilla x Megaguirus: G Shōmetsu Sakusen (ゴジラ×メガギラス G消滅作戦, lit. "Godzilla x Megaguirus: G Annihilation Strategy") is a 2000 science fiction kaiju film directed by Masaaki Tezuka and written by Hiroshi Kashiwabara and Wataru Mimura. It was the twenty-fourth film released in the Godzilla franchise, and the second film in terms of the franchise's Millenium series. It premiered at the Tokyo International Film Festival on November 3, 2000. The film shares the suit used in Godzilla 2000, so it will be a direct sequel because Godzilla rampaging the cities though it was separate continuity. After Godzilla 2000, Godzilla continues to rampage and destroys the entire cities until dives into the sea and waits to the destruction. In 2001, an experimental satellite-based weapon that fires miniature black holes, called the Dimension Tide, opens a wormhole through which a prehistoric dragonfly enters the present and deposits a single egg before exiting through the wormhole. A boy finds the egg and takes it with him when he moves to Tokyo. The egg starts oozing a strange liquid, so the boy throws the egg in the sewer. The egg, actually a mass of hundreds of eggs, splits up and starts growing when exposed to water, hatching into large dragonfly larva called Meganulon that come out of the sewer to feed. They flood a portion of the city and moult on the sides of buildings, becoming adult Meganula. Meanwhile, the atomic dinosaur Godzilla appears, in search of a source of nuclear energy, despite the edict shutting down all such attractants after his three previous appearances. Godzilla, Mothra and King Ghidorah: Giant Monsters All-Out Attack (ゴジラ・モスラ・キングギドラ 大怪獣総攻撃 Gojira, Mosura, Kingu Gidora: Daikaijū Sōkōgeki) is a 2001 science fiction kaiju film directed by Shūsuke Kaneko, written by Kaneko, Keiichi Hasegawa and Masahiro Yokotani, and starring Chiharu Niiyama, Ryudo Uzaki, Masahiro Kobayashi and Mizuho Yoshida. It is the twenty-fifth installment in the released in the Godzilla film series as a part of the Millennium series. Set nearly 50 years after the events of Godzilla, the film tells the story of a revived Godzilla possessed by the spirits of the Japanese soldiers that died in World War II. Godzilla returns to destroy Japan. Taizo Tachibana, admiral of the Japan Self-Defense Forces, intends to attack Godzilla. Meanwhile, his daughter Yuri searches for the three guardians, Mothra, King Ghidorah and Baragon. They must stop Godzilla from obliterating the country. The film was released in the United States on cable television on August 31, 2003 then followed with a DVD release in early 2004. In Tokyo, following the giant monster attack on New York City, a meeting of the Japan Self-Defense Forces (JSDF) is held to discuss the potential return of Godzilla. During the meeting, Admiral Taizo Tachibana briefs cadets about Godzilla's attack on Tokyo 50 years earlier. A nuclear submarine is reported missing, which is later found to have been destroyed by Godzilla. Tachibana's daughter, Yuri Tachibana film a docudrama with her crew at Mt. Myoko, where a mysterious earthquake randomly ensues. The odd earthquake returns later that night burying a biker gang and leaving one surviving trucker who witnesses the monster, Baragon. Godzilla Against Mechagodzilla, released in Japan as Godzilla × Mechagodzilla (ゴジラ×メカゴジラ Gojira tai Mekagojira), is a 2002 Japanese science fiction kaiju film directed by Masaaki Tezuka, written by Wataru Mimura, and produced by Toho Co., Ltd. It is the 26th installment in the Godzilla franchise and the fourth film to feature Mechagodzilla. Unlike much of the Millennium Series and like Godzilla 2000, the film takes place in continuity with other Toho films, notably Godzilla, Mothra, War of the Gargantuas, Space Amoeba and its successor, Tokyo S.O.S. 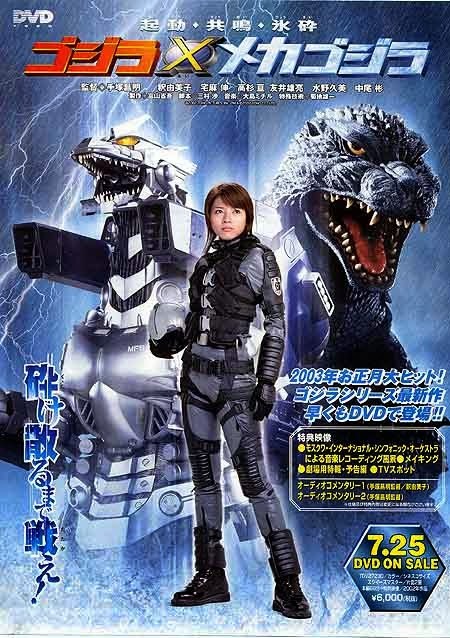 In 1999, 45 years after Godzilla's first attack, Lieutenant Akane Yashiro, a mazer-cannon technician, is unable to kill a new member of Godzilla's species during her first fight. She is made a scapegoat for the military's losses during the battle and transferred to a desk job. During the battle, it was discovered that Godzilla is immune to mazer fire, rendering all of the Japanese military useless against him should he return. Scientists, including single father Tokumitsu Yuhara, are gathered to build a bio-mechanical robot from the original Godzilla's skeleton. Four years later, the cyborg Mechagodzilla, named Kiryu, is finished and inducted into the Japan Self-Defense Forces along with its human pilots as the Kiryu Squadron. Akane becomes the main pilot for Kiryu. However, memories of Akane's actions during the original fight still linger, and one of her squadron mates, 2nd lieutenant Susumu Hayama holds her responsible for the death of his brother. A while later, Mechagodzilla is shown to the world, and the complete system that controls the unit is explained. Controlled remotely from a control craft that resembles a very large jet fighter with VSTOL capabilities, it can be remotely recharged from the ground using microwaves that are relayed through a power system on one of the command aircraft, and then beamed back down to the robot. Meanwhile, on Infant Island, two twin Mothra larvae hatch from Mothra's egg, and rush to help their mother. Godzilla: Final Wars (ゴジラ ファイナルウォーズ Gojira: Fainaru Wōzu) is a 2004 Japanese Science fiction Kaiju film directed by Ryuhei Kitamura, written by Wataru Mimura and Isao Kiriyama and produced by Shogo Tomiyama. It is the 28th installment in the Godzilla film series, and the sixth in terms of the series' Millennium era. The film stars Masahiro Matsuoka, Don Frye, Rei Kikukawa, Kane Kosugi, Maki Mizuno and Kazuki Kitamura. The film is set in a future where mutant soldiers are in the ranks of the Earth Defense Organization. An invasion by the alien Xiliens unleashes a legion of giant monsters across the world, leaving behind only a few surviving humans. The survivors travel to the South Pole to free Godzilla from his frozen prison while another group attempts to infiltrate the alien Mothership and take out the Xiliens. As a 50th anniversary film, a number of actors from previous Godzilla films appeared as main characters or in cameo roles. In addition, various Kaiju (monsters) made reappearances, as most were last seen more than 30 years earlier. 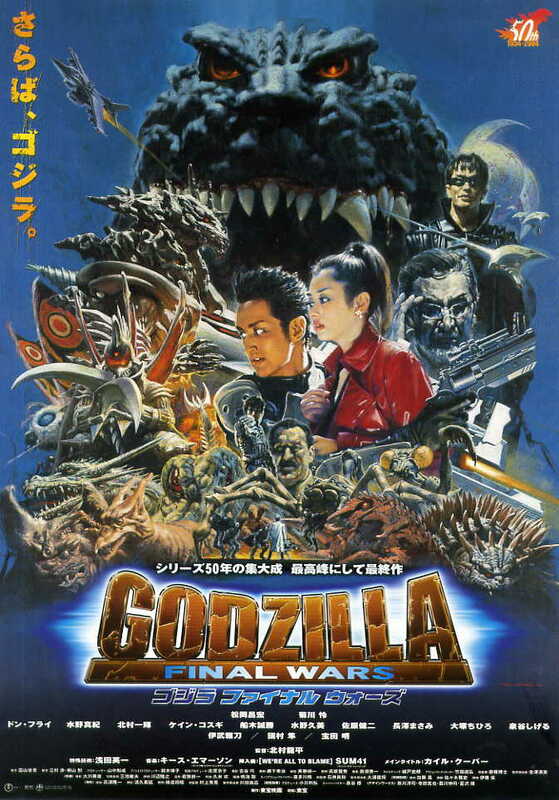 Godzilla: Final Wars premiered on November 29, 2004 in Los Angeles, California and was released on December 4, 2004 in Japan. Before the world premiere, Godzilla received a star on the Hollywood Walk of Fame. 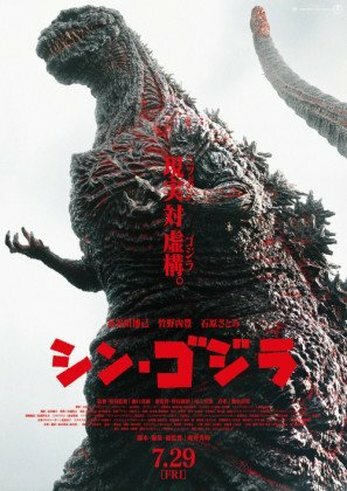 Director Ryuhei Kitamura has compared Godzilla: Final Wars to that of a musician's "Best of" album, stating "We picked lots and lots of the best elements from the past and combined it in a new way. It's what I love about Godzilla and what I don't love about recent Godzilla movies". In 2004, endless warfare and environmental pollution has resulted in dangerous kaiju and the Earth Defense Force (EDF) is created to protect the planet. Shin Godzilla (シン・ゴジラ Shin Gojira, also known as Godzilla: Resurgence) is a 2016 Japanese kaiju film featuring Godzilla, produced by Toho and Cine Bazar and distributed by Toho. It is the 31st installment in the Godzilla franchise, the 29th Godzilla film produced by Toho, and Toho's third reboot of the franchise. The film is co-directed by Hideaki Anno and Shinji Higuchi, with the screenplay by Anno and special effects directed by Higuchi. The film stars Hiroki Hasegawa, Yutaka Takenouchi, and Satomi Ishihara and reimagines Godzilla's origins in modern Japan. In December 2014, Toho announced plans for a new domestic Godzilla film. Anno and Higuchi were announced as directors in March 2015. Principal photography began in September and ended in October with the special effects work following in November that year. Inspiration for the film was drawn from the Fukushima Daiichi nuclear disaster and the 2011 Tōhoku earthquake and tsunami. Shin Godzilla had its premiere at the Hotel Gracery in Shinjuku, Tokyo on July 25, 2016 and was released nationwide on July 29, 2016, in IMAX, 4DX, and MX4D. It received acclaim from Japanese critics and mixed to positive reviews from Western critics. The film was the highest-grossing live-action Japanese film of 2016 and is the highest-grossing Japanese-produced Godzilla film. At the 40th Japan Academy Prize, it was nominated for 11 nominations and won seven, including Picture of the Year and Director of the Year. When the Japan Coast Guard investigates an abandoned yacht in Tokyo Bay, their boat is destroyed and the Tokyo Bay Aqua-Line is flooded. Godzilla: Planet of the Monsters (GODZILLA 怪獣惑星 Gojira: Kaijū Wakusei, also known as Godzilla Part 1: Planet of the Monsters and Godzilla: Monster Planet for short) is a 2017 Japanese computer-animated science fiction kaiju film featuring Godzilla, produced by Toho Animation and animated by Polygon Pictures, in association with Netflix. It is the 32nd film in the Godzilla franchise, the 30th Godzilla film produced by Toho, and the first animated film in the franchise. It is the first film in the anime trilogy and is co-directed by Kōbun Shizuno and Hiroyuki Seshita. The film was released theatrically in Japan on November 17, 2017 and released worldwide on Netflix on January 17, 2018. In the last summer of the 20th century, giant monsters began appearing all over the world and wreaking havoc. A powerful creature called Godzilla appeared which destroyed humans and monsters alike. Two species of aliens, the Exif and the Bilusaludo, arrived with the former attempting to convert humanity to their religion and the latter seeking to emigrate to Earth with promises to defeat Godzilla with Mechagodzilla, should humanity accept them. However, the Bilusaludo were unable to activate Mechagodzilla, which forced the aliens and humanity to abandon Earth and emigrate to Tau Ceti e via the Aratrum. 20 years later and 11.9 light years away, Captain Haruo Sakaki locks himself in a shuttle, threatening to bomb the area unless the Aratrum leaves Planet Tau-e and abandons the emigration project. Haruo believes the planet is uninhabitable and the emigration crew only consists of the elderly, including his grandfather, because he believes the Aratrum's committee are trying to reduce the population due to limited resources. Haruo fails, is arrested and thrown in a cell where he witnesses the emigration shuttle exploding upon entering the planet's atmosphere. 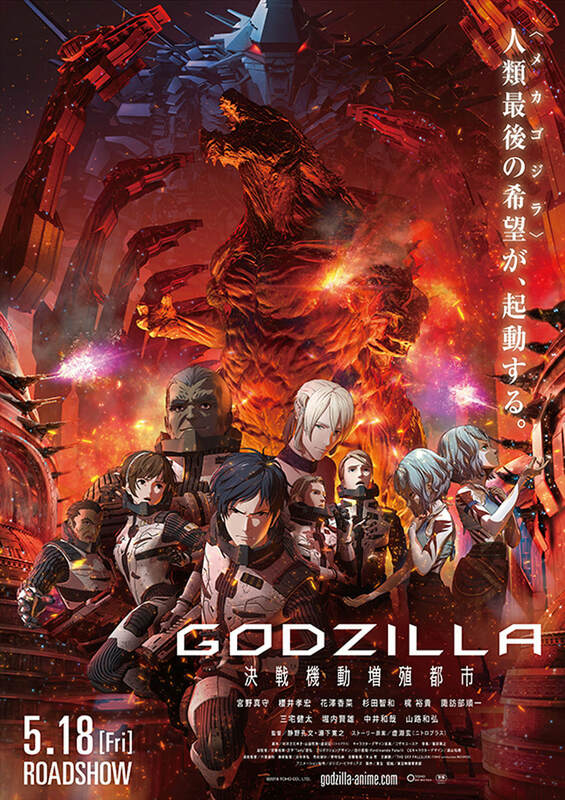 Godzilla: City on the Edge of Battle (GODZILLA 決戦機動増殖都市 Gojira: Kessen Kidō Zōshoku Toshi, also known as Godzilla Part 2: City on the Edge of Battle) is a 2018 Japanese computer-animated science fiction kaiju film featuring Godzilla, produced by Toho Animation and animated by Polygon Pictures, in association with Netflix. It is the 33rd film in the Godzilla franchise, the 31st Godzilla film produced by Toho, and the second entry in the anime trilogy. 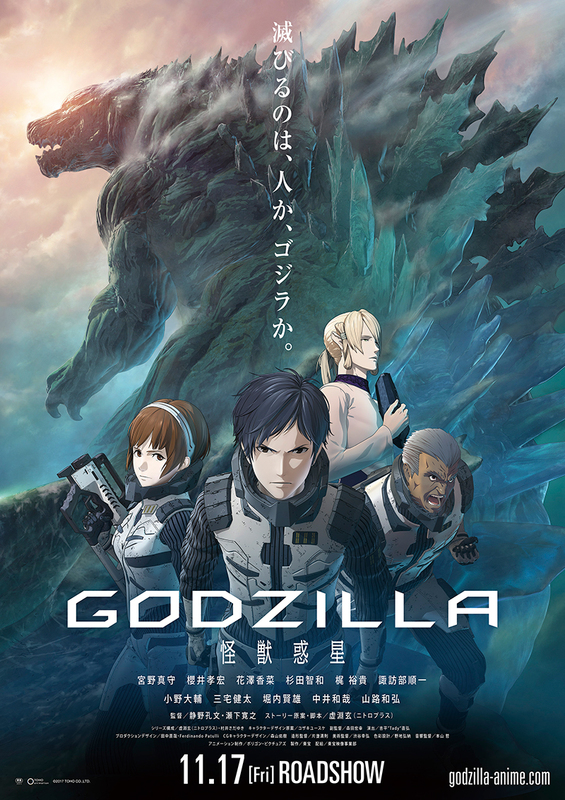 It is a sequel to Godzilla: Planet of the Monsters and is co-directed by Kōbun Shizuno and Hiroyuki Seshita. The film was released theatrically in Japan on May 18, 2018 and released worldwide on Netflix on July 18, 2018. Following the events of Godzilla: Planet of the Monsters, the Aratrum is unable to contact Haruo and the rest after their encounter with the original Godzilla. The Captain orders that if drones do not find survivors by forty-eight hours, the Aratrum will withdraw from Earth. After the Houtua realize the group was after Godzilla, the twins inform Haruo that their god was destroyed by Godzilla and left behind an egg. With an understanding that Haruo is waging war against Godzilla and not the Houtua, they are released, but the twins accompany them as both protective guides and observers. Godzilla: The Planet Eater (ゴジラ-星を喰う者 Gojira: Hoshi wo Kū Mono) is an upcoming Japanese computer-animated science fiction kaiju film featuring Godzilla, produced by Toho Animation and animated by Polygon Pictures, in association with Netflix. It will be the 34th film in the Godzilla franchise, the 32nd Godzilla film produced by Toho, and the third and final entry in the anime trilogy. It is a sequel to Godzilla: City on the Edge of Battle and is co-directed by Kōbun Shizuno and Hiroyuki Seshita. The film is scheduled to be released in Japan on November 9, 2018. 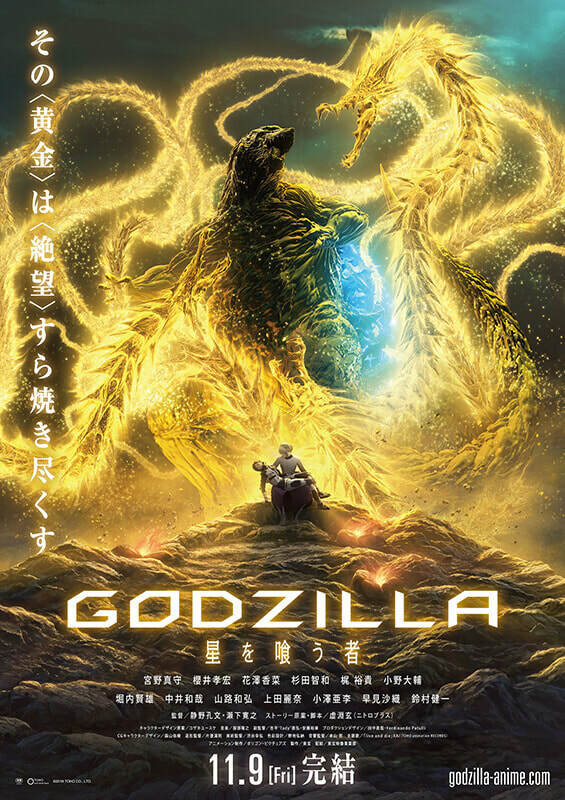 In May 2018, a teaser poster revealed the film's title, release date, and potential appearance of King Ghidorah. On July 31, 2018, the film's first teaser trailer was released.